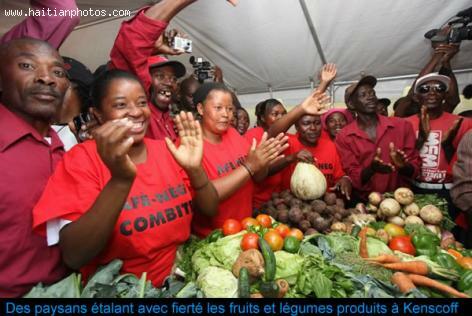 Kenscoff is located in the Ouest Department in Port-au-prince Arrondissement in Haiti. It has around 4000 inhabitants. It is situated ten kilometers southeast of the capital of Haiti, Port-au-Prince. Grand Fond, Belle Fontaine, Touraine, Sourcailles and Bongaille are the five sections Kenscoff municipality is divided into. Kenscoff lies within the coordinates 72° 17' 13" West and 18° 27' 2" North. It is located at a height of 1500 meters. Average temperature of this place is lesser when compared to the climate at Port-au-Prince, the capital of Haiti. It is quite cold during the winter months and wearing a jacket or a sweater, becomes necessary. The temperature ranges between 26 to14 degrees centigrade. The coldest months are December, January and February. 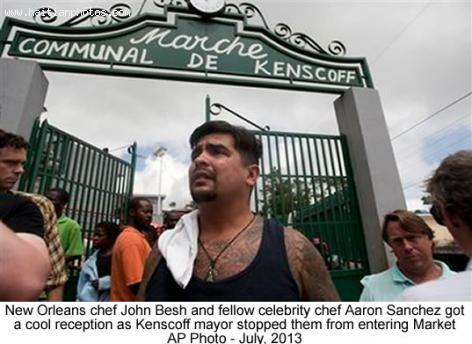 Aaron Sanchez and John Besh, got cool reception at "Marche Communal de Kinskoff"
They came with the promise of publicity to bring awareness to the plight of Haiti's food crisis. The idea was that they could raise awareness of the current conditions by touring facilities like the farmers market, snapping pictures of desperate adults and children and talking with the press in Haiti and abroad about the experience. However, one Haitian mayor wanted none of it, and wasn't afraid to protect what she viewed as the integrity of her town from the intrusive good-doing of two celebrity chefs. John Besh, a finalist on the Food Network show, The Next Iron Chef, and Aaron Sanchez, who appeared on the shows, Heat Seekers and Chopped on the same network, flew in to Haiti on Sunday, July 28th and promptly toured one of the numerous settlements established by the homeless in the wake of the earthquake three years ago. Haiti's 2010 earthquake, which shook the country to its foundations, especially Port-au-Prince, displaced tens of thousands of Haitians. They were reduced to living in the streets, without adequate sanitation. Nine months later in October of 2010, a cholera epidemic began, and has continued afflicting the poorest segment of Haitians, many of whom remain living in tent cities. The Ministry of Public Sanitation and the Population has recorded 581,952 cases of cholera as of July 2012, with a 7,455 death tally since October 2010. A noticeable rise in cholera cases have been reported since early 2012 in Centre, Nord, and Port-au-Prince. Port-au-Prince neighborhoods reporting cases of cholera include: Carrefour, Cité Soleil, Delmas, Kenscoff, Petionville, and Tabarre.